In this episode of BTS84, Gabe and Priscilla Tuft head to Las Vegas for vacation! We get insider tips on how to eat when on vacation, two full workouts for chest and for arms, and one helluva ride in a Lamborghini Gallardo Spyder. If you’ve ever wondered how to drive a Lamborghini, we get the full tutorial. Gabe and Priscilla met up with former WWE Superstar and current New Japan tag team champion, Lance Hoyt. The three of them crushed a high volume arm workout full of supersets that will leave your triceps and biceps pumped like never before. Using an EZ curl style bar for triceps, be sure to lock your upper arm in place so that only the hinge at your elbow is moving. Watch Gabe in the video for proper form. On biceps, roll your shoulders forward and keep your elbows tucked in tight to work the short head of the biceps. On the incline curls, roll your shoulders back and keep your arms behind you slightly. 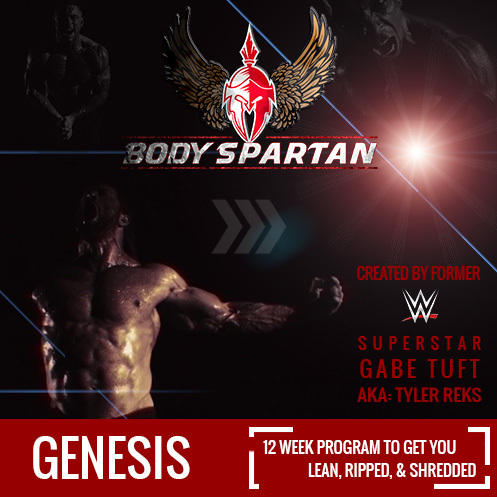 Watch Gabe carefully in the video for form, as this position will work the long head of the biceps. Keep your elbows in tight throughout this entire movement. The second you start to flare them is the second the tension moves to your pecs and off of your triceps. Also, get your grip as close as possible without putting excess strain on the wrists. We prefer slightly closer than shoulder width. Exaggerated close grip will only result in injury. We prefer to do these simultaneously so that the tension never releases on either arm. Form is crucial on all of these exercises. We are specifically targeting the biceps and triceps and should do our very best to remove every other muscle group from the movement. If you find yourself swinging weight for more than one or two reps on ANY set, it’s time to ditch the ego and drop the weight.